Up to $10,000 in donations will be matched through Sunday, March 4. The Oregon Humane Society honored heroic people and pets at the annual Diamond Collar Awards luncheon, Wednesday, Feb. 28. Recipients were recognized for their kindness, diplomacy, resiliency and courage. Their inspiring stories represent OHS’s vision of a more humane society. 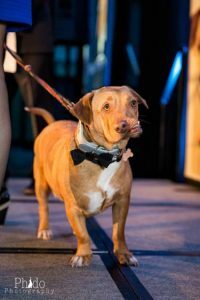 The Diamond Collar Awards are also one of the biggest fundraisers of the year for the Oregon Humane Society. Wentworth SubaruCity and Subaru of America were the presenting sponsors of the event and have offered to match donations, up to $10,000, to OHS through Sunday, March 4. Click here to donate today. Award recipients include a compassionate veterinarian from Klamath County; a dog whose road to recovery saved a young girl’s life; a canine social media superstar; and a horse rescue powerhouse. “The OHS Diamond Collar Awards are a wonderful way to honor the people and pets who are making a difference in our community,” said Sharon Harmon, OHS President and CEO. Harmon hosted the awards with KGW chief meteorologist Matt Zaffino. Honor this year’s Diamond Collar Award Heroes and help save the lives of pets with a donation to the Oregon Humane Society! Your gift will provide food, medical care, shelter, and second chances to rescued and homeless pets. All gifts will be matched up to $10,000 through 11:00 p.m. on Sunday, March 4. Click the button to the left donate. Picasso: The dog with a twisted snout who became a social media superstar and taught the world that it’s ok to look different. Watch the video about Picasso. Piper: A victim of animal neglect, Piper’s case has created new dialogue about the intersection of animal and human abuse. Watch the video about Piper. Dr. Doug McInnis: The veterinarian who created the Klamath County Animal Control Task Force – connecting the district attorneys with animal control, law enforcement, and veterinarians to address animal neglect and abuse. Watch the video about Dr. McInnis. Sound Equine Options: SEO’s robust network of foster homes provides care, rehabilitation, and training for neglected horses. Watch the video about SEO. Your gift saves lives. Please give today and help a pet in need.